For nearly three centuries, as the Black Death rampaged through Europe and the Reformation tore the Church apart, tens of thousands were arrested as witches and subjected to trial, torture, and execution, including being burned alive. 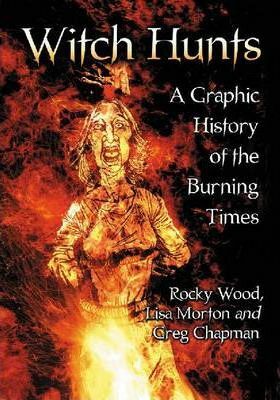 This graphic novel examines the background; the methods of the witch-hunters; who stood to profit; the brave few who protested; and how the trials finally faded as Enlightenment replaced fear and superstition with reason and science. The book examines famed witch-hunters Heinrich Kramer, architect of the infamous Malleus Maleficarum; Matthew Hopkins, England's notorious ""Witch-finder General""; King James I, supposedly the target of assassination by a Scottish coven; the Salem Witch Trials; and the last witch trials and executions in Europe. Rocky Wood is the author of two Bram Stoker Award-nominated books on Stephen King and is regarded as a leading King expert. He is president of the Horror Writers Association and a member of the Australian Horror Writers Association. He lives in South Yarra, Victoria. Lisa Morton is a playwright, an author of fiction and a screenwriter in addition to her numerous reference works. A recipient of the prestigious Bram Stoker Award for superior achievement in horror writing, she lives in North Hollywood. Greg Chapman is fiction writer, and horror illustrator, specializing in comics and graphic novels. Two horror novellas were published in 2011 and his short stories and art have appeared in Australia, the United States and the United Kingdom. He lives in Central Queensland, Australia.